Southpawian Fury: Happy Xmas + Holidays + Etc.! Happy Xmas + Holidays + Etc.! 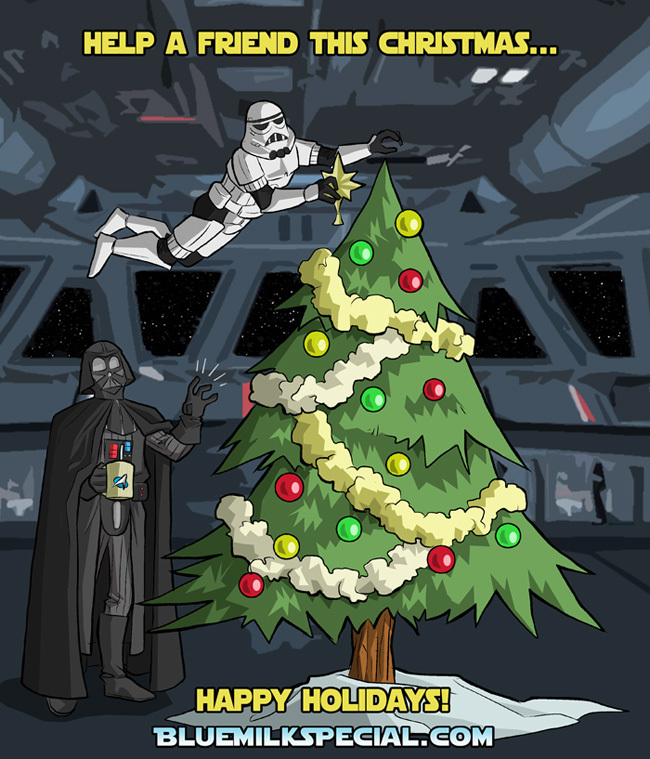 Above is the holiday greeting we used as a voting incentive pinup for Blue Milk Special this year as Vader and TK8008 enjoy themselves with a bit of holiday cheer. Hope everyone had a nice holiday! While at Power-Con I was interviewed by MTV Geek. You can watch both clips (if you DARE) in which I talk about my work on He-Man and the Masters of the Universe and Blue Milk Special. Apart from that, Rod and I also had a great time at the Virginia Comicon in Richmond, VA in October. It's always great to meet up with friends and fans, and the VA show was no exception. Extra thanks to Matt, Suzanne and Charlie Wieringo for being such great hosts! Love you guys. Apart from all that, work continues on BMS, though we had serious doubts as to whether or not things would keep going as they are. At the beginning of this month we had a scare with Rod's health issues (for which he's having surgery in January), and having to read nitpicky comments from readers knocking us for trivial things right in the middle of all this real life drama just didn't mix well. We questioned whether it was worth dealing with keeping BMS going at all. But in the end we had a really great response from readers (we were both totally overwhelmed by the support), that we decided to keep going, at least for now. But in order to do this, give Rod time to heal and have time to work on our own projects, we're cutting back to one strip a week beginning in 2012. But fear not, we'll still be around (I think Biggs might kill us if we weren't). So... with that finished, here's to a much better year for everyone. Bring on 2012!